I really wish I had a better picture of this dip, a picture that did it justice. Admittedly, it lacks color, texture, and pretty much everything else that makes a good culinary picture. Please don’t let that deter you because it is delicious. I have been making this for years and it never disappoints. Brie on its own is fabulous but it is totally transformed when it is melted into this gooey dip. The addition of cream cheese and sour cream gives the dip a smooth texture. Cooked onions and garlic add a savory note that is contrasted with a little brown sugar and lemon juice. It smells so good while it is baking. The Perfect Pairing for Baked Brie Dip is a spoonful of cranberry sauce. 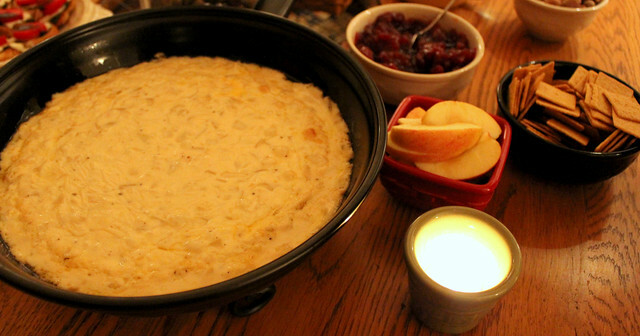 I discovered this when I made this dip for an appetizer night the day after Thanksgiving and served it with leftover cranberry sauce. The combination is, well, perfect. I know, I overuse that word. If it is not the day after Thanksgiving you can use the store-bought variety. 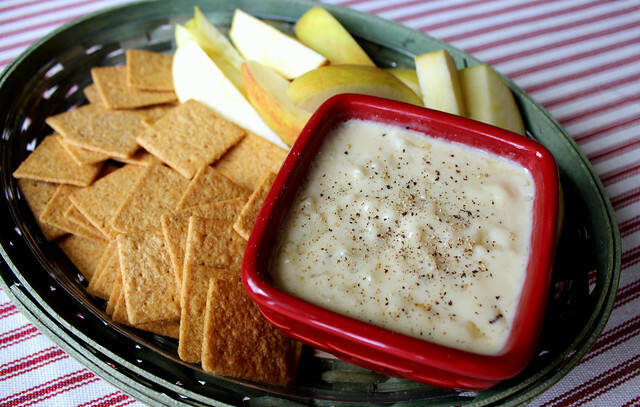 I usually serve this dip with simple crackers, apple slices, and cranberry sauce. Preheat the oven to 350 degrees F. Coat a large baking dish with cooking spray. Heat the butter in a skillet over medium-low heat. Add the chopped onions and garlic and cook until softened and translucent. This should take about 10 minutes. In a large microwave-safe bowl combine the cubed brie and cream cheese. Melt in the microwave for 2 – 3 minutes, stirring occasionally. Stir in the sour cream, onion mixture, brown sugar, lemon juice, and Worcestershire sauce. Taste for seasoning and add salt and pepper. Pour the brie mixture into the baking dish and cover with foil. Bake in the oven until bubbly and warmed through, 20-30 minutes. Ah! You should put your cranberry sauce recipe on here that goes along with it! It's the best!